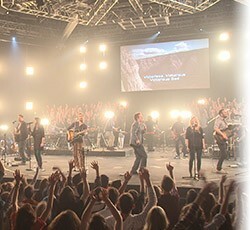 That’s why the heartbeat of New Life Worship - the team of vocalists,musicians and songwriters - is to help people encounter Jesus and develop a life of worship. Every song, every resource, every facet of New Life’s ministry is designed with that end in mind. Tried and tested, New Life is a strong local church with deep roots in worship, youth ministry and missions. With a solid group of writers, New Life’s songs, including “I Am Free,” “Overcome,” “My Savior Lives,” “Here In Your Presence” and “Your Name,” have traveled far beyond their local faith community, finding a home in the hearts of believers around the globe. whole whose chief purpose is to lead people to God’s throne.